Matt Kenseth: Wow! Another championship win. But what next for Michael Waltrip, Martin Truex Jr., and Clint Bowyer? 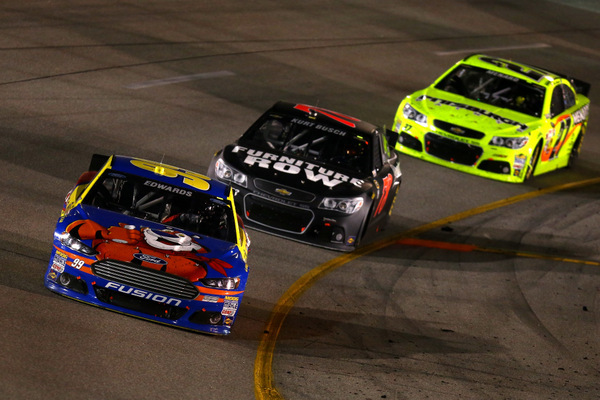 What next in the fallout from the NASCAR championship chase embarrassment at Richmond? 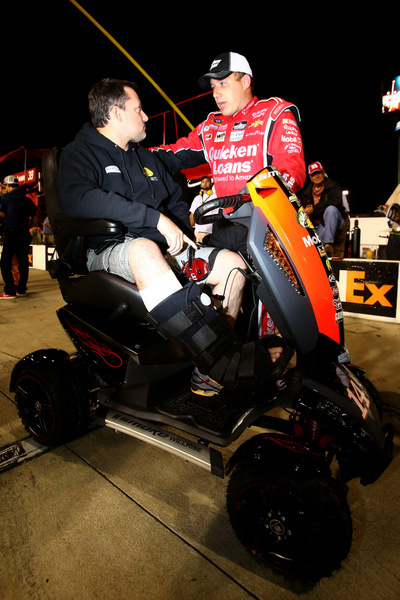 Ryan Newman: Will NASCAR now remedy Richmond's apparent wrong and put him and Jeff Gordon into the championship playoffs? 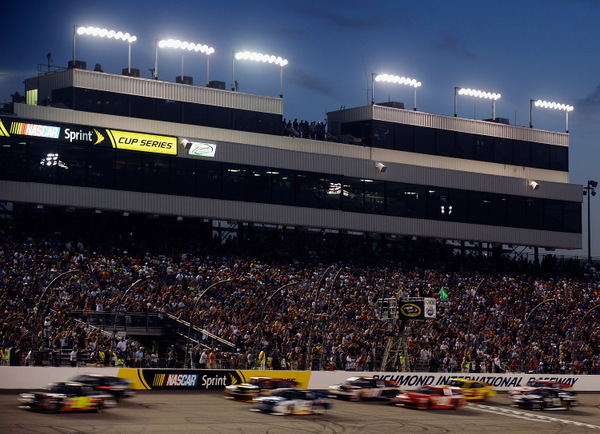 Carl Edwards got a good jump on the final restart with only three laps to go and slipped away to his second win of the season, the Richmond 400 Saturday night, on a crazy, crazy night for anyone trying to figure out those final few spots in the NASCAR championship chase. Jimmie Johnson, who dominated much of the early season before hitting a slump after running second at Indianapolis in late July, had yet another very bad night. He fell far behind early, and things went from bad to worse. He finally blew a right-front, had a battery problem, and finished 40th. In his last four starts Johnson finished 40th, 36th, 28th and 40th, the worse four-week stretch of his career. Three men even more disappointed at the end of the 400-lapper were Jeff Gordon, Brad Keselowski and Ryan Newman, who all had shots to make the playoffs but missed. The 12 men making the Sprint Cup playoffs, which open next weekend in Chicago, are the top-10 over the 26-race regular season – Edwards, Johnson, Clint Bowyer, Kevin Harvick, Kyle Busch, Matt Kenseth, Dale Earnhardt Jr., Kurt Busch, Greg Biffle and Joey Logano – plus two wild cards, Kasey Kahne and Martin Truex Jr.
Truex got that final spot over Newman on a tie-breaker, more second-place finishes overall. Edwards finished the regular season with the most points, in something of a surprise, considering Ford teams have appeared underpowered this season, a point even Edwards talked about only a week ago. Keselowski dominated much of the 2-1/2-hour race. And Kurt Busch ran strong too. Busch held on to finish second, just ahead of Newman. However Keselowski got trapped by an untimely yellow, the Johnson caution. Gordon had loose lug nuts midway and had to make an unscheduled pit stop, from which he never really recovered. A caution with only 10 miles to go set up a restart with 12 laps to go, Edwards versus Newman on the front row. Newman charged into the lead quickly, knowing he needed to win to make the playoffs. 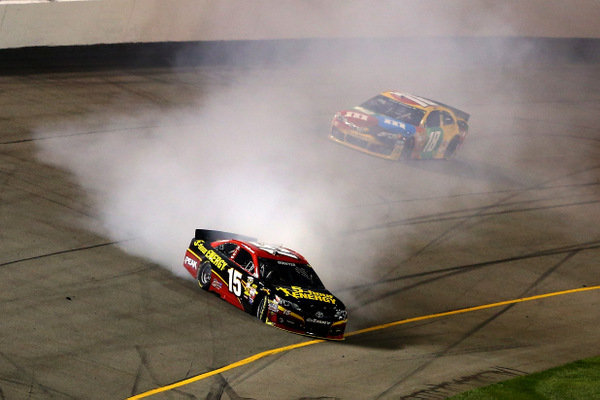 And things looks great for Newman, until Clint Bowyer spun with just seven laps to go. The leaders all pitted, Paul Menard taking only two tires and thus getting the point for the final restart with three laps left. Edwards got a good jump on the restart, for the lead. Newman, fifth for that restart, charged to third but it wasn't enough. "My pit crew won this race for us," Edwards said. "We're going to win this championship. And that might have seemed something odd to say only six weeks ago." Newman, on the other hand, was despondent. "That last caution killed us," Newman said. "But we should have been able to come out of the pit stop the first team on four tires. "If we are to be a championship-contending team we've got to have a championship pit crew, and we didn't have that. "Four tires (changed) won the race, and we were in position to be the first team on the restart with four (new) tires. We just didn't get the job done." "Things did not go well. We would literally wear the right-front tire off the car. "But as I look at the string of bad races we've had here over the last three, four weeks, at the majority of the tracks in the chase we've been fast.
" 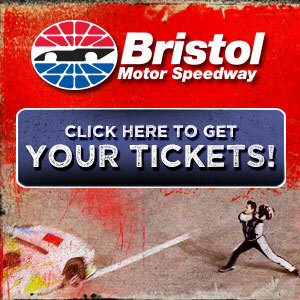 I'm glad Richmond and Bristol aren't in the chase. The 10 tracks in the chase are very good for this team. We'll start over on a clean sheet of paper next weekend and go at it. "You want to enter the chase with momentum….not with no momentum like we have no. But every team falls back on past history…and we have won championships without momentum going into the first race. "The chase is so different than anything else. You're only racing 12 guys, not 43; so things change a lot. "We're going to go to a track (Chicagoland) that is very good for us. We had a tire test there earlier. "I'm going to reserve any major concern or overwhelming confidence until after Chicago. I'm going to go in there with confidence I can win, because I know I can." Conspiracy buffs might have something to play with, considering Bowyer's late spin helped teammate Truex make the playoffs and cost Newman a spot. But Bowyer dismissed such talk. "I think we had something going wrong," Bowyer said. " We went from a car capable of winning the race, and leading, and it just went straight backwards. Extremely tighter, tighter, tighter, tighter." 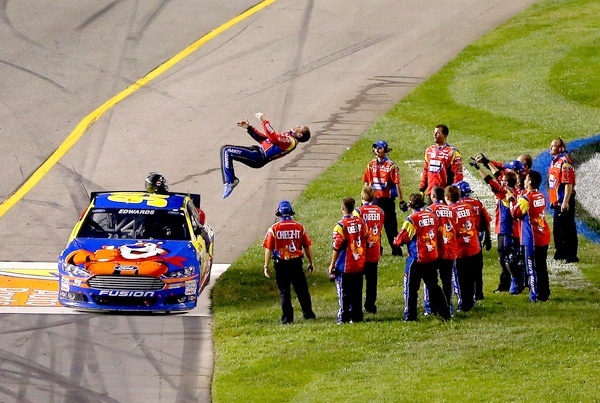 Then Bowyer said Earnhardt "got up under me. I had so much wheel (in his hands) by the time I got to the gas, and he was under me, I spun out. "It's unfortunate. Trust me, I would have much rather been winning the race than in here bummed out….Extremely bummed, extremely even more bummed once you get out and realize there were implications. "There's bound to be. Doesn't matter whether it was me or anybody else. When it comes down to crunch time, the last race….it's wild to think, after all the racing -- Talladega, Daytona, wild cards, road courses -- you come here and there are six, seven, eight cars running for those one or two spots. "But my car was tight as hell. And Jimmie just blew a tire and hit the wall. I'm telling you I was the next one. "I know it's a lot of fun for you guys to write a lot of whacky things. Go ahead if you want to; get creative. But don't look too much into it." Earnhardt said he didn't touch Bowyer and had no idea what happened to Bowyer's car: "He just spun right out. That's the craziest thing I ever saw. He just came right around. "I don't know if they (NASCAR) can pull up his brakes and his gas (computer data). We got all the technology. But he was hemming around on the brakes and jerking the car around, and then the thing just spun out. "It was crazy. I don't know what was going on. "I almost run into it, so I'm glad we were able to get out of there without any trouble." Menard and crew chief Slugger Labbe were upset with how Edwards handled that final restart, claiming Edwards jumped too fast. "I can understand why he'd be frustrated about that restart," Edwards conceded. "What happened is Paul had two (new) tires. (The rest of the leaders had four.) I knew he was going to be at a big advantage with grip. "He took off; I waited until he went to go. "As we were going, his car actually touched my door. I think it surprised him a little bit. He turned a little bit, I heard his engine speed up (as) he spun the tires. "At that point I have a choice -- either lift and wait for him to try to gather it up -- but I've never seen a guy able to gather it up too quickly when they spin that bad -- or go… and hope NASCAR understands he spun his tires. "In this case they did understand. "The guy in second place in that circumstance is in a tough position. If I had lifted and waited, I think the whole field would have run over us. "If he had four tires, it probably would have been different." Submitted by Lauren Leaf on Sat 09/07/2013 - 20:56. I think Clint Bowyer and Truex should be penalized for cheating. Bowyer spun out on purpose to get Truex in the chase. They both should be knocked out and Newman and Gordan should be put in the chase. Submitted by Fireball Roberts on Sun 09/08/2013 - 19:00. NASCAR took two wins away from Jimmie Johnson for beating the leader to the start/finish line, and Edwards should have been black flagged last night or made to give the spot back. It's not a judgement call. The rule is very clear. NASCAR just chose to turn a blind eye and decided that Carl Edwards was going to win no matter what. If Bowyer did indeed do what everyone suspects that he did, I lost a ton of respect for him. You just don't do that stuff. He should receive a major penalty, and Newman should get into the Chase instead of Truex. Anything less than that is an injustice. What he did was almost as bad as NASCAR throwing cautions for phantom debris.